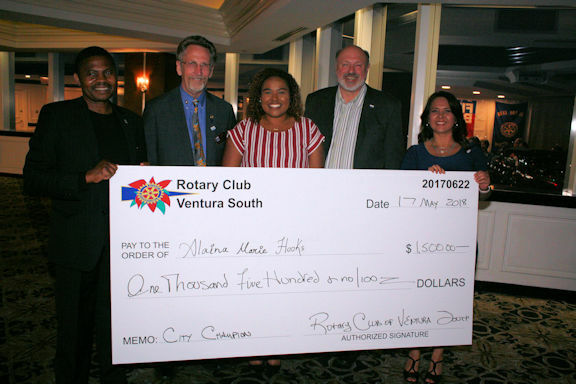 On Thursday, May 17, the Rotary Club of Ventura South awarded $6,300 in scholarships to students from Buena, Foothill Technology, and Ventura High Schools - finalists in the Club's first annual high school speech contest. The talented and eloquent students wrote and presented their speeches on the American Civil Rights movement to a panel of judges including current Rotary District 5240 Govermor John Weiss (second from left in the photo above). The event was held at the Tower Club in Oxnard. Winners in the Freshman class included Kaitlyn Saldana (1st place, $1,500, Buena) and Angela Tang (2nd place, $750, Buena). The sophomore finalist was Joshua Cenzano ($1500, Buena). There were no junior entrants. In the Senior class, Alaina Hooks (center in the photo above) came in first ($1,500, Foothill Technology) with Aspen Levitt placing second ($750, Ventura) and Jonathon Saldana taking third ($300, Buena). Invitations to participate went out to all Ventura high schools in March, and the initial round of competition was conducted on campus for students at the responding schools. First Bank of Ventura contributed $2,000 to the project. Club President Bob Davis commented, "We're excited to sponsor this first annual event as a means of supporting education in our community and encouraging students to develop their public speaking skills. We look forward to welcoming even more students in the coming years." Bob, together with Club Community Service Co-Chair Sal Saldana, coordinated the event. For additional photos of the event, see the album here.